Mama (2013) is a horror movie directed by Andres Muschietti and produced by Guillermo del Toro. Synopsis: Five years after a father kidnapped his two young daughters, their uncle, Lucas (Nikolaj Coster-Waldau) finally found the girls, Victoria (Megan Charpentier) and Lilly (Isabelle Nélisse), in the cabin where they have been living for the past five years. Lucas and his girlfriend Annabel (Jessica Chastain) manage to obtain custody for the girls with a deal made that the girls' doctor, Dr. Dreyfuss (Daniel Kash) can continue to monitor the girls' progress. Both girls are seen talking to walls and are extremely vicious upon human contact. Lilly can hardly speak and walk. Both girls continue talking about the presence of someone, or something, as "Mama". I tell you, horror movies with creepy, haunted children are the spookiest kind of horror movies. The deranged "Mama" ghost is the perfect scare factor that every time she appears, you wouldn't want to look at her at all. "Mama" the ghost or Edith when she was still alive, was a mad woman stricken by grief. Now that she's dead and became a ghost for more than a century, she's an angry ghost, harming everyone who comes between her and the girls. I find that this movie is far more chilling in its quieter moments, especially when the girls seem to be so comfortable with the on-and-off presence of Mama. That actually adds a sense of foreboding. Megan Charpentier is perfect as Victoria and Isabelle Nélisse as fiercely devoted little Lilly to Mama will scare you silly with her charming smile, awkward silence, and occasional defiant acts. 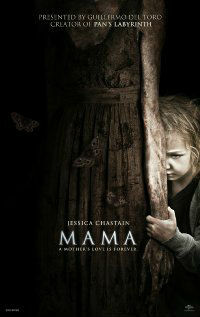 If you are a big fan of horror movies, don't miss watching this one and get spooked by Mama! Note: Not for the faint-hearted.